The Principles of Knitting purchased by Gina Mitchell and brought into the shop to show everyone. It is what one would call a coffee table book. The book weighs in at 4 pounds 8.8 ounces and is roughly 8 1/2″ x 11″ in size and a depth of 2″. It is an impressive book. After looking through her copy, I had to have one for the shop. What does this book have to offer? Everything. There aren’t any flashy slick color plates. 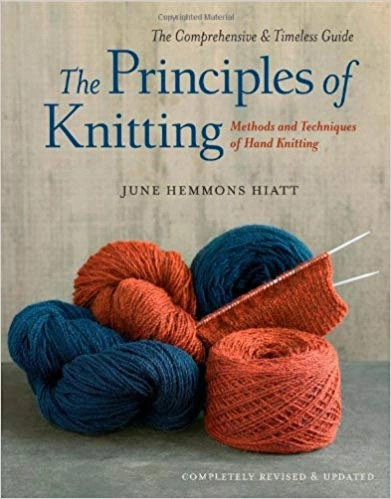 June Hemmons Hiatt’s, The Principles of Knitting, is 712 pages of comprehensive reading on all aspects of hand knitting. 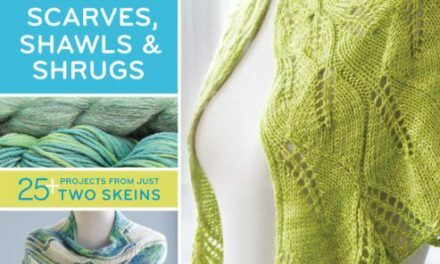 The publisher describes it as, “The definitive book of knitting techniques. Pages 37-71 cover numerous methods of casting on with detailed explanations and advice on which cast on should and should not be used. Selvages and Steeks are explained in detail. Several methods of knitting, right or left handed knitting and more. Pages 80-93 cover casting off. Increase and decrease patterns such as in lace. Yarns and where they originate. Tips for working a project and fixing errors. I only touched the surface with my list of items found in The Principles of Knitting. The chapter on Color Work will be a valuable resource for a class I am teaching on Stranded Knitting. I am delighted that I added this book to my library and thankful that Gina Mitchell brought it to my attention.